The game at Windsor Park on 28 March will be the second of two matches for Michael O'Neill's men in March. Slovenia were beaten in Euro 2016 play-offs by Ukraine, who are among Northern Ireland's group opponents in France. "Slovenia are a great choice. While they lost 2-0 in Ukraine they drew 1-1 at home and played well. They're a good side," said NI boss O'Neill. A proposed March friendly against Poland was called off as the two teams were drawn together in the same Euro 2016 group. 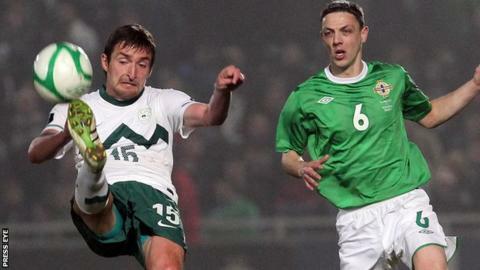 Northern Ireland last played Slovenia in the Euro 2012 qualifying campaign. Corry Evans scored the only goal in a Northern Ireland victory in Slovenia in September 2010 before a scoreless draw at Windsor Park seven months later.